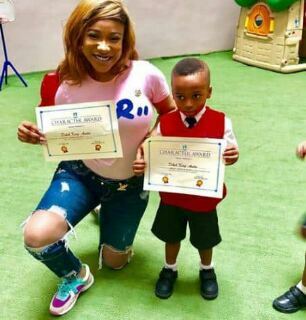 Nollywood actress, Tonto Dikeh has finally changed her son’s surname to ‘Dikeh’ after she had taken to social media to hint about it recent. In photos she shared on social media from her son’s school’s Character Award day, it shows that her son’s surname has been changed to ‘Dikeh’. The husband of the controversial actress, Olakunle Churchill is yet to react.